"Hurtle too knew better than everybody, than all these anyway, Sid Cupples included; not that he could have explained what he knew: because he saw rather than thought. He often wished he could think like people think in books, but he could only see or feel his way. He itched to get his fingers in their wool, for the feel of it." Hurtle Duffield is the developing artist in Patrick White's novel, 'The Vivesector,' who as a child, is visiting his adopted parents' property - a sheep ranch - from which their wealth flows (as it did for White). I had marked the passage, when I read it first, an age ago, which was/is a very rare occurrence. It was the first page I read on getting home on seeing the Edward Burra exhibition yesterday. One of those coincidences that we are to pretend do not mean anything. 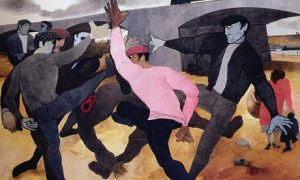 Today visited the Edward Burra exhibition at the Pallant Gallery in Chichester. In any other country, this would not be the first exhibition he had enjoyed for thirty five years. He would probably have his own museum -possibly on a hill top in Rye where he lived for the whole of his life. A running strand through the commentary was Burra's 'sinister side': how many of the paintings are tinged with possible or implicit threat, as here, in 'The Straw Man', being kicked by a group of men from which a woman hurries her child away. 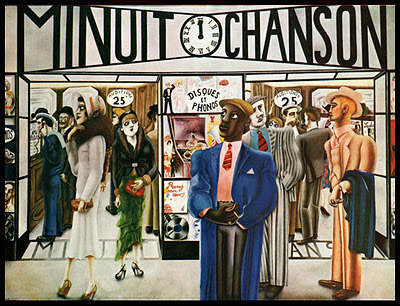 It is true this is a theme - the world carries implicit threat - especially in those places of "disreputable' life that Burra loved to paint: the streets of Harlem or in the back streets of Marseilles where, as in one picture, the 'cheap' prostitutes, relax in the sunlight, one attending to the nits in her hair, a simple occupational hazard. Testimony to the vivid nature of the novelist, Patrick White's, language comes from re-reading his, 'The Vivisector' after a pause of over 25 years and it floods back into memory, even particular phrases have their lodgement refreshed in my mind. 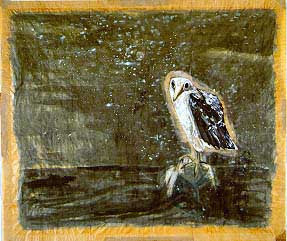 White was an accomplished collector of art and it seems to me a frustrated painter. His language is both exceptionally visual and visceral. Here he is describing the life of Hurtle Duffield - the fictional development of an artist from early precocious childhood through until death. 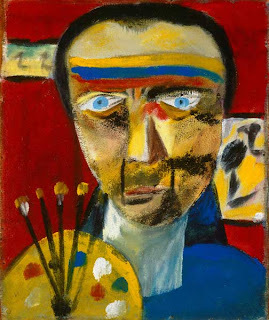 It vividly draws on his extensive and deep knowledge of art and the artistic process - his own and borrowed. A rare opportunity to see the work of this great English artist whose unique vision I deeply love. He was democratic, compassionate and tinged with vision - and utterly unwilling to discuss his art directly. He used to call this talking about his work 'fart'. He was a gifted friend whose witty, engaging, gossipy letters are a delight. He was from an early age crippled by arthritis that made him an observer and his quiet heroism in response to his illness is wholly admirable. As Christopher Rowland in 'Blake and the Bible' admirably demonstrates the Bible was both Blake's favourite book, his deep familiarity with which informed both art and poetry, and the text of which he was most cautious. For this Christian radical, the Bible was a resource for understanding, not an infallible guide, it was a starting point for understanding, never an end, an opening text, never one that closed off avenues of understanding. For "The Bible or Peculiar Word of God, Exclusive of Conscience or the Word of God Universal, is that Abomination, which....is for ever removed & henceforth every man may converse with God & be a King & Priest in his own house." 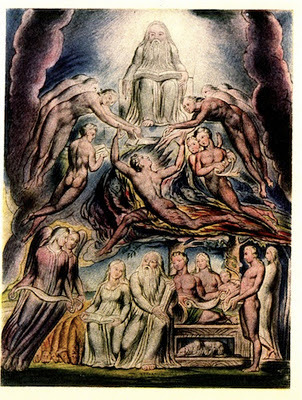 The second of twenty-one engraved plates by William Blake illustrating (illuminating) the Book of Job. You will notice a resonance in appearance between the face of God, enthroned in heavenly splendour and the face of Job whose self-contained world is about to be disrupted by Satan. For Blake, Job's journey is one from a religion of pious complacency bound by moral rules and a transcendent deity ordering about the world to an internalized vision of his own existential participation in the divine life. God dwells within and has a human face. We dwell fully in God who imagines forth a world that inspires our life. I have embarked on Christopher Rowland's "Blake and the Bible". Rowland is a distinguished Biblical scholar with a particular specialism in the interpretation of two of Blake's favourite books - Ezekiel and Revelation. Andrew Harvey relates in his marvelous book, "A Journey in Ladakh' how he gave a Tibetan Buddhist monk Nietzsche to read, hoping to convince him that 'the West' had thinkers of substance. The monk duly worked his way through Nietzsche's work and replied, in essence, what an extraordinary insight Nietzsche possessed and what an extraordinary confession that he finally succumbed to madness clinging to the neck of horse being flogged, trying to protect it from harm. A confession because his thinking, his system lacked compassion. Likewise A. E. Waite stood up in the middle of a lecture by P.D. Ouspensky, declared that there was no place for love in his, Ouspensky's system, and walked out. 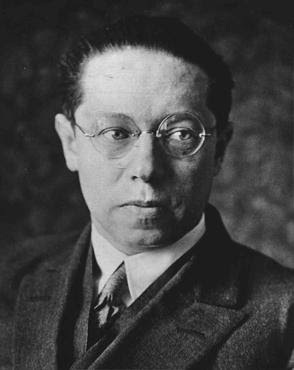 I have finished Lion Feuchtwanger's 1925 novel, 'Jew Suss' down thinking, "Now what was that about?" Ostensibly it concerns the rise and fall of Joseph Suss Oppenheimer as financial counsellor in the state of Wurttemberg in the eighteenth century. Having cast in his lot with the man who becomes Duke, he manipulates his relationship, with cunning and skill, to both advance the Duke's interests and massage his own position. However, when the Duke becomes the cause of the death of Joseph Suss' daughter, he turns against him, unwinding his power in such a stark way as to precipitate the Duke's death from shock. Stripped of the Duke's protection, he exposes himself to downfall and he is hanged as a scapegoat for the manifold sins of the Duke (and his) regime. Kirby Ferguson's video embedded in our new blog is excellent - you copy to innovate! 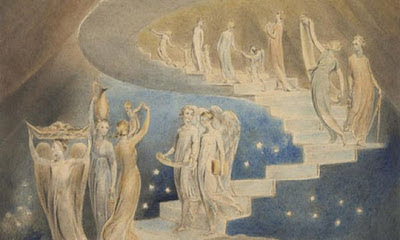 And William Blake learnt Italian (in his 60s) in order to understand the Divine Comedy better such that his illuminations better revealed his understanding of the text! "Hast thou ever raised thy mind to the consideration of existence, in and by itself, as the mere act of existing? Hast thou ever said to thyself thoughtfully 'It is'... If thou hast indeed attained to this, thou wilt have felt the presence of a mystery, which must have fixed thy spirit in awe and wonder." Coleridge writing in The Friend. 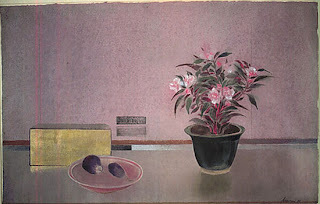 This would be an apt summary of Graves' state of mind in his late flower painting, stripped of symbolism, and delighting in their 'suchness', their being just so. The anthropologist, Hugh Brody, describes in his 'Out of Eden' the paradox of how nomadic hunter gatherers or pastoralists have found themselves bound to particular places, living within them from a knowing particularity and love whereas farmers have found themselves ultimately restless, imagining that the grass always will be greener in the next valley (or having exhausted their current valley, the next one becomes greener by default)! Thus, is the cult of progress inaugurated. After experimenting with poetry reading over breakfast rather than reading the newspaper to the benefit of my felt well-being, this week I have been studying paintings over the muesli. I began with Morris Graves. The uplift has been the same, framing the day's mind not with images of the brokenness that haunts our newspapers but the hard sought for, and realized, wholeness of these images. Here are two characteristic images of lone animals, poised on edge of spaces: water for the bird, desert for the snake, the sky for both, reflective of energy and of contemplation. It is a practice that does come with a sense of guilt, of ignoring 'reality' embedded in the 'news' and yet raises the simple question: which reality: the time bound flux of potential history or the symbolism of a different order? No, not in this instance, a Greek default (though it is very interesting that everyone behaves as if they should be surprised by this, when many will admit to its virtual inevitability in private) but a deeper doom. Last night at dinner in conversation with the chair of a highly respected consultancy that works with top companies on their sustainability agendas, it was admitted that many of the more enlightened CEOs he knows recognise that the system is bust and have no obvious remedies - except working at improving their performance within the existing space. All the indicators - social, resource constraint and environmental - are moving in the wrong direction.